Near Gaffney, South Carolina between exits 95 and 96, Interstate 85 separates to allow for a wider median. The reason - a small family cemetery that dates to the mid-1800s. The Lipscomb-Sarratt or Ross-Lipscomb cemetery is an example of the numerous small family burial plots that were found within many rural farms and plantations throughout the South during the 18th and 19th centuries. The cemetery consists of at least 13 gravestones with six that still have legible markings. Most of those buried passed away between 1850-1880. The cemetery is also one of the oldest in Cherokee County. How the cemetery came to exist in the middle of an increasingly busy Interstate 85 is an interesting story. 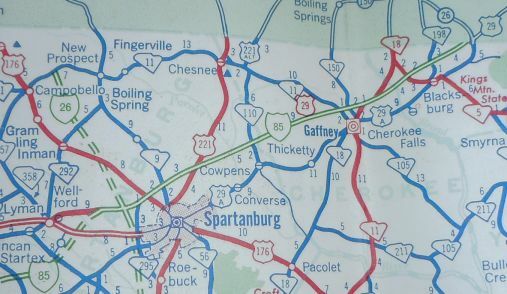 In the early 1950s, South Carolina moved US 29 onto a newly built a two lane express highway from the North Carolina State Line near Grover to northwest of Spartanburg. At the time, the cemetery sat just to the new highway's south. What is now the Southbound lanes of Interstate 85 carried this new highway. When the Interstate Highway System was created in 1956, the new US 29 highway would become part of Interstate 85. With two lanes of the road already built, South Carolina quickly built two additional lanes of highway and closed any existing at grade intersections. By 1959, a four lane Interstate 85 was open in the area. SCDOT, wishing not to disturb the gravesite, built the new northbound lanes of the highway immediately to the south of the cemetery. For years, the cemetery was accessible by a little known dirt road that connected the two carriageways of the Interstate. This was to allow relatives of the families to maintain some upkeep of the grounds. Over time, the dirt road has disappeared and upkeep of the property has become more difficult. Distant relatives or anyone that knew of the site and wanted to investigate typically will park on the right hand shoulder and hustle across the highway. Currently, a construction project that will widen Interstate 85 to six lanes has resulted in concrete barriers along the median making it rather difficult to visit the site. The construction project is expected to last until 2021. The widening project will keep the wide median and cemetery intact. Conley, Linda. "Ross family members in median of I-85." Spartanburg Herald Journal. April 29, 2001.